Hmm, I had a bunch to say about used phones and my history with different models, skip to about halfway down to find the actual details on returning a phone to stock. It’s interesting to look back over my personal smartphone ownership history. All of them have been purchased ‘used’ but some were barely used, where others saw heavy use. For the most part I’ve not had any real problems with the phones, but there have been a few exceptions. My price point has generally been under $200, but I’ve scored a few at the $150 mark too. Resale of the phones hasn’t been a strong point of mine, I usually keep them (sometimes idle on my desk) to the point where I’m getting less than half what I paid for them. Still I think I’m ahead in terms of the diversity of the phones I’ve had, and my total layout in cost. The Nexus 4 was a great phone for me, I used it for almost 2 years before swapping to a Nexus 5. It wasn’t without problems, something went wrong with the charging circuitry (part of the motherboard) and it was destroying batteries by mis-charging them. I went through a couple aftermarket batteries before finding a donor phone that had a good motherboard. Gave my nexus 4 a motherboard transplant last night.. Maybe that'll resolve the battery over heating issue. I flipped the donor phone with now bad motherboard and ended up $20 out of pocket to fix my Nexus 4. I ran with this fixed phone for nearly another year. In the Nexus 4 ownership phase, I ended up having Jenn switch from iOS to Android, and so I started getting 2 of the same phone. Late in 2016 the Nexus 5 (32GB) came below the $200 price point. I ended up buying 3 within the span of a couple of weeks. Hmm. Seems I now have too many smart phones. Nexus 5 (3), Nexus 4 (2), Galaxy S2, iPhone 4s.. And a partridge in a pear tree! 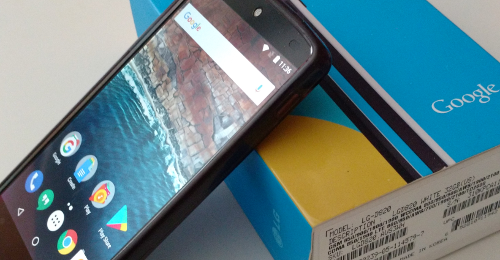 Of the 3 Nexus 5’s, it turns out one of them had something wrong with it. After a little while that bad phone started to randomly reboot, and sometimes even turn itself off and refuse to power back on. You could get it back, but had to fiddle with it for some time. I ended up taking this phone and using it as my daily driver to see if I could isolate and fix the issue. It felt like it might have been the very common power button problem, but a local repair shop didn’t think it was. Instead of trying to fix it myself, I just upgraded to the Moto X Play and sold the bad Nexus 5 (with full disclosure on it’s issues) as a parts phone for $50. Oh yeah, and that gets us to the returning to stock story..
Google hosts all of the stock images, so you can grab the latest one for the Nexus 5. The codename for the Nexus 5 is “hammerhead”, and I wanted the GSM/LTE version. For my phone, the latest is 6.0.1 from Dec 2016 – and remember always verify checksums on the downloads. My desktop is Ubuntu, so these are Linux instructions. This also assumes you’ve enabled ADB support in Android. The bootloader screen should indicate “LOCK STATE – unlocked” – since of course you’ve loaded an alternate community firmware on the phone. If you’re cautious (and curious) like I was, you’ll take a peek at the flash-all script. It does what you’d expect. Running the script will flash multiple things to the phone, be patient. Once the script is done, the phone will reboot to the newly installed image. Now, to fully re-stock the phone we’ll lock the bootloader. Since we don’t have ADB enabled, we’ll use the power + down vol to get bootloader screen. You’ll go through another initial boot / wipe and end up with a Nexus 5 that is fully back to stock (with a locked bootloader). If you’re interested in going the other way, installing a custom ROM – I wrote about that a while back. This entry was posted on Sunday, May 28th, 2017 at 9:22 pm	and is filed under Android. You can follow any responses to this entry through the RSS 2.0 feed. You can leave a response, or trackback from your own site.